According to federal transport regulations, the Health of Animals Act, Part XII, Sections 143, (1)(d) and (e), “No person shall transport or cause to be transported any animal in a railway car, motor vehicle, aircraft, vessel, crate or container if injury or undue suffering is likely to be caused to the animal by reason of undue exposure to the weather or inadequate ventilation.” Yet, in Canada, farmed animals are routinely transported in the winter during subzero temperatures in inadequate conditions, and often during the coldest times of the day (early morning, night). Although temperature extremes are common in Canada (read our article about heat stress), the transportation industry has yet to take proper measures to mitigate or prevent the risks such extremes cause to the animals, and equip their trucks with heating systems to maintain proper temperatures in the winter, and forced air to dissipate the moisture forming inside the trailer (and help animals cool in the summer heat). At present, Canadian trucks only have improper passive ventilation resulting from the movement of the vehicles, and often inadequate tarps (in the case of poultry trucks) or vent/porthole covers (in the case of livestock trailers). CETFA has also documented many instances where animals were transported in freezing temperatures with no tarps or covers whatsoever. Animals transported in the winter in unheated, improperly ventilated trucks with inadequate, or absence of, tarps or covers are subjected to extremely low, and in some cases lethal, temperatures due to the combination of cold temperatures and wind caused by the truck speed (wind chill effect) and blowing in through the sides. For example, a truck moving at 50 miles per hour when the outside air temperature is 20 degree F (-7 C) is analogous to a wind chill of -23 degrees F (-31 C) for the animals. If the truck is traveling against the wind, the wind chill effect is even greater. Animals forced to stand close to the sides of the trailers, or to the back, and exposed to cold winds due to the lack of proper protection from the ailments may suffer from hypothermia, get frostbites, freeze to the sides and even die. While all farm animals can suffer from cold stress during transport, some are particularly susceptible. This is the case of pigs, shorn sheep, calving cows, young, sick and injured animals in general, as well as all poultry, during the transport of which hundreds, if not thousands of animals, may die (read our posts “Ontario poultry slaughterhouse found guilty of cruelty to animals” and “Lilydale charged for violations of the Health of Animals Act and Meat Inspection Act“). Even when temperatures are milder, animal may still lose too much internal heat and die from hypothermia if freezing rain or snow blows into the truck and wet the animals. This is true for all animals, including cattle and sheep who lose insulation from their coat when it becomes wet. 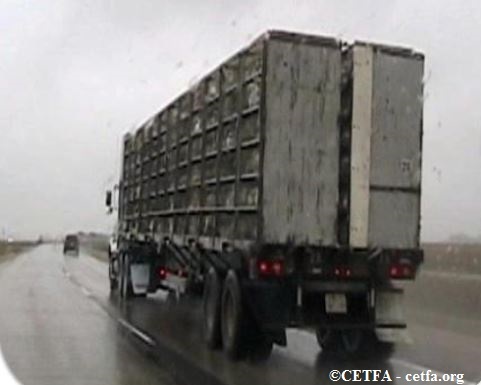 While CETFA believes that animals should not be transported during temperature extremes, and that Canadian transport trucks should be retrofitted to include forced air and heating systems, we are calling on truckers to at the very least: 1) ensure that the animals’ fur or feathers are dry at the time of loading, and that they remain dry during transport; 2) provide sufficient bedding to help insulate the animals, and ensure that the bedding stays dry; 3) cover the openings of the trucks while ensuring the animals get adequate passive ventilation. ; and 4) decrease the loading density per truck to give the animals enough room to move and re-position themselves inside the trailer to avoid freezing on its sides. If you see farm animals transported in inadequate conditions or suffering from cold stress, please contact the Canadian Food Inspection Agency (CFIA), the government body responsible for the enforcement of farm animal transport regulations, to report your concerns. Provide details of your observations (location, time of the day, name of the transport company, and D.O.T number printed on the rig, as well as the species transported, the outside temperature (and if possible wind chill) and the signs of cold stress you observe). As more and more people are becoming concerned about farm animals, public involvement will be instrumental in improving the welfare of farm animals during extreme weather conditions. Untarped poultry trailer in cold and humid conditions, Manitoba.